Interior plumbing has existed since 2500 B.C., which means plumbing problems have been plaguing human beings for a substantial amount of time (and they’ll continue to). Fortunately, we’re no longer in the Neolithic Era of plumbing services and technology, but today’s plumbing problems are the same as they’ve always been. The infamous clogged drain is one of the chief annoyances of homeowners, and the problem pops up more often than people think. 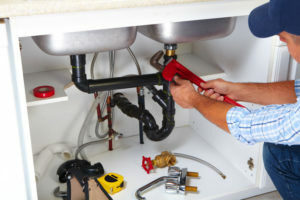 While simple clogs are rarely major problems, going without drain cleaning can lead to additional issues that will cause a need for plumbing services a bit more serious than fixing a leaky faucet. Let’s look at why your drain is clogged. Soap and hair: The dynamic duo of clogging shower and bathroom sink drains. It might not seem like much, but the constant combination of hair and soap buildup create blockages that water can barely trickle through. Hair, soap chemicals, and hard water create soap scum, so staying aware of drain speed is a good way to monitor build up and catch it ahead of time. Food and grease: Kitchen sinks are notoriously abused. Just because it washes the gunk, food, and grease off dishes, it doesn’t make the drain invincible. Grease and food particles gather together over time and form gelatinous masses (very gross) that sometimes get so large that unblocking requires plunger suction (very common in commercial sinks in the food/beverage industry). Try to get as many chunky particles as possible in the garbage can before you bombard your kitchen basin. Ancient pipes: This is more rare but certainly a realistic concern. Old pipes with even the tiniest cracks are vulnerable to any number of intruders whilst buried underground. Tree roots have even been known to grow into pipes and clog them, causing a great deal of confusion after every drain clog remedy has been attempted to no avail. Plumbing services account for this now, but it’s safe to know the history of your home. Older homes with older structures are more liable to have issues like this, so run your risk analysis ahead of time. Drains don’t get a lot of attention, and they perform their jobs faithfully day in and day out. Staying on top of keeping them clear is as simple as the occasional application of drain clearing chemicals and hot water. If you’re noticing a sink, shower, or bathtub not draining as fast as usual or water begins pooling, now you know what’s generally making it happen. Keep up with clearing your drains, because faithful prevention keeps plumbing repair away as long as possible.